This recipe for Malted Chocolate Chip Cookies is a really old one, which I believe comes from Crisco. It’s a little different in that along with the malted milk powder it calls for shortening instead of butter, plus 2 tablespoons of chocolate syrup. Also, it’s made with 100% light brown sugar and no granulated, so as you can guess it’s a shade darker than most chocolate chip cookies. 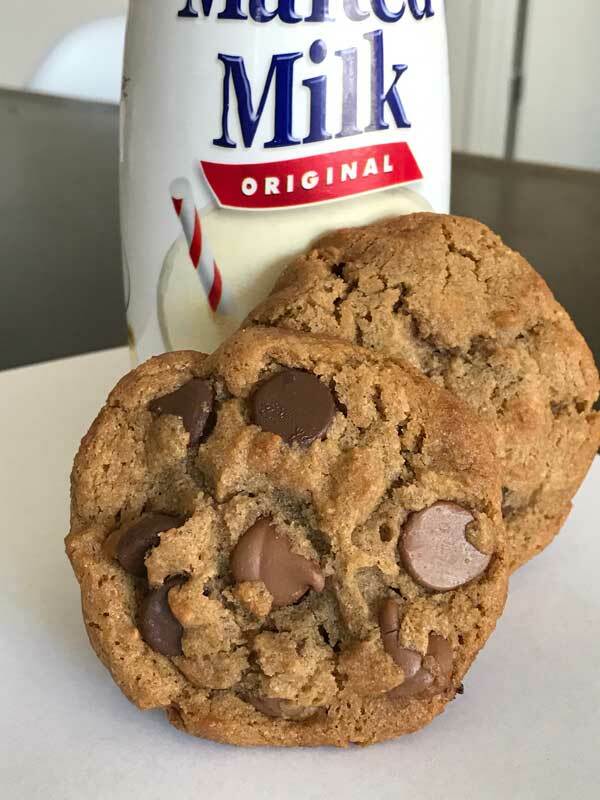 All these things come together for a cookie that’s slightly thicker than most, has crunchy edges and an interesting flavor. For the malted milk powder, I use Carnation brand which comes in a red and white canister. A brand called Horlick’s would also work. For the fat, this recipe works best with the Crisco. Sorry, but butter makes the cookies a little too flat. The good news is that if you want to make a butter based malt cookie, there’s a different recipe. These Malt Chocolate Chip Cookies are good too, but different. What’s special about the Malted Chocolate Chip Cookies with the Crisco and the chocolate syrup (I never said they were healthy!) is that they are darker, thicker and slightly crumblier. They also have a little more malt flavor. In a mixing bowl, beat together shortening, brown sugar, malted milk powder, chocolate syrup, and vanilla; beat for 2 minutes. Mix in egg. In a small bowl mix flour, baking soda, and salt. Gradually add to creamed mixture. Shape into 1 1/2 to 2 inch balls; place about 3 inches apart on ungreased baking sheets. Bake for 10 to 14 minutes or until golden brown. Cool for 2 minutes on pan before removing to wire racks to cool completely. Tara, a lot of recipes call for 1 egg. It really just depends on how you want your cookie. This dough seems to get enough moisture from the 1 egg and the chocolate syrup. However, your addition of 1 egg yolk sounds interesting — especially considering you make these as bars. Yolk has a different consistency than egg whites so you’re adding a bit of fat, moisture and not quite as much protein as if you added a whole egg. The yolk, plus the melted butter must make your bars soft, moist, and dense. They sound great! I’m going to have to try making these your way. This is one of my new favorites! Only I make bars because it’s just quicker and easier. And I melt the butter and add an extra egg yolk. Am I correct for adding the yolk to bars? It seems most cookie recipes call for 2 eggs; why does this one call for just one? I *love* the malt flavor in these! And I enjoy telling people the secret ingredient they are tasting but can’t quite place! The Hershey’s syrup adds a little something extra, too! Hi Tasha!Glad you liked them. Now you’re going to have to figure out how to use the rest of the malted milk powder :). Anna, thanks for the clarification. I tried the cookies. YUM! They were delicious! Thanks for sharing the recipe! Anna – I can’t find malted milk powder anywhere in the stores where I live. Can you use the malted version of Ovaltine? That’s the closest I can get. What brand of malt powder do you use? I bought some the other day (Carnation, I think) but when I got it home I realized that it was chocolate malted drink mix. I’m sure I’ll be able to use it for something, but I wasn’t sure if it was the right thing to use for these cookies.Thanks! Tasha, I revised it to make it clearer. I said lack of eggs, but I meant that it was lacking in eggs with one egg as opposed to the usual two. So I edited a bit be clearer. Thanks for bringing that to my attention. Hi Tasha,They do have one egg :).Hope you like it. The malted choc chips look very good! I’m going to go make some so I can use up my malted milk powder, but just wanna check, so these cookies do have egg in them? You mentioned in your writeup that these did not have eggs but the recipe has an egg in it. Sorry, just want to be sure before I start. Thanks! The Malted Chocolate Chip Cookies are rather handsome! So are they more of a cakey cookie?